Nice and warm for cold climate. Love them. Hypoallergenic and generously filled, this luxurious down alternative comforter provides outstanding warmth and unparalleled comfort. End-to-end box construction helps eliminate cold spots, while the cotton and polyester blend fabric features a thread count of 800. A variety of versatile and tranquil color options make it easy to find the best match for your sheets and pillow shams. I bought 2 Hotel Grand Damask 800tcdown alternative comforters, bed nicely done with a child to down allergies this is a great alternative,. Ordered the brown to match and update a Moroccan themed room. She wanted a "puffy" comforter, similar to a white down one, but in a color. I was concerned once it arrived, as it was sent compressed. A note said that it would take 48 hours to get puffy again, but I was skeptical. After a full 2 days it was exactly what we wanted. I would recommend! I am very happy with this comforter. Previously I had real down, but I decided to go with the down alternative because of the lower price for the queen size. It's a slightly different feel, but still comfortable and warm. The best part is that it's very easy to clean, which is perfect for anyone with dogs or kids. I don't know if there are official washing instructions, but I always wash and dry mine at home without any problems. (Though I probably wouldn't do that if you're going to use it without a duvet, because the stitching won't look as nice after.) This is a good value overall, and I recommend it. Read the dimensions. 88" x 88" is not really big enough for a queen bed. Yes it will be narely adequate to cover up two smaller people but you might be fighting for coverage. Bigger people will not be happy. When the bed is made the comforter barely makes over the edge of the foot of the bed. So basically this is a comforter for a full size bed and they just slapped "queen" in the description. Quality wise I won't know much until it has been used. It isn't terribly thick but fine for 71 F degree A/C controlled rooms. It looks decent enough as well, though if you are looking for something that is high end this is not for you. This is an average comforter. I want to return this thing for being too small but I'm not sure I want to deal with the hassle. Purchased this comforter for my son several months ago. It has been washed numerous times and still looks as good as when we first go it. It is warm without being too heavy. The baffle box construction has kept the filling in lace and when it comes out of the dryer- it is fluffed and evenly distributed. I was looking for a new lightweight comforter that didn't contain ethically or allergenic-ally questionable materials. This fits the bill. It fluffed up nice and even, it didn't have any noticeable odors, and the cover material is soft and beautiful. I put it in a comforter cover straight away and my plan is to never wash the blanket itself. We use a futon so the full/queen size is sufficient coverage for myself and my husband. If you have a big bed you might size up but this fits the dimensions of a queen size duvet cover perfectly. I decided to give 5 stars because the other reviews helped me to select this item. Time will tell, but so far, so good. Received this only 3 business days after ordering. Paid $$ in total for the queen size delivered to the door with sale coupon. Purchased this item in March 2015. This comforter was well worth the money. 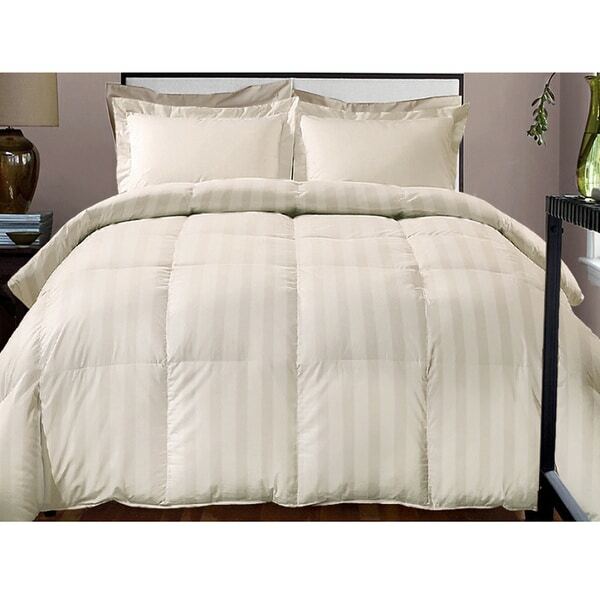 The quality is amazing and for it to be a thin not very heavy comforter it keeps you extremely warm. Im very happy with this purchase i also got it in the tinted blue color and its color is the same as the photro. I was looking for an all cotton down alternative and finally found this. It is the perfect weight and I throw it in the washing machine once a week and it holds up very well. Looks beautiful. We bought the comforter to use during the summer months that can be hot during the summer in Maryland. We are very pleased with the weight and quality of the comforter. I gave this as a gift to my son and his wife and they love it! Warm and cozy. Easy to wash and dry in machines. Love this comforter, beautiful, washable & still looks new. The quality it just fabulous. Purchased this comforter for my grands and he rushes me to wash it all the time. Going to have to purchase another one. Really great quality. I was very pleased with comforter so soft and warm. Love this soooo much I can’t get out of bed!!!!! Warm, soft and so comfy!! "Does this comforter have ties on the ends to prevent it from slipping inside a duvet cover?" "Is the ivory a light ivory color--not yellow?" The ivory is not yellow. It's a true ivory color. "the shams come with the comforter?" "where can I find pillow shams to match this comforter?" Hello Erma F., we do not currently have the matching pillow shams available on our site. Thanks for shopping with us! "Does the sage actually look like a dark sage or does it look like a light green ( or celery)?" Hello Kimber, the sage looks more like a light green. Please let us know if you have any further questions. "Is the second picture smoke blue?" Hello dwasserman03, the second picture is the smoke blue option. Thanks for shopping with us!